Why Do You Need Efficient SQL Server Database Auditing? Any unauthorized production database access or change to permissions on a database level in one of your SQL Server instances is a serious matter. DBAs have to be able to quickly detect and investigate the event before it turns into a breach or other SQL Server security incident. To track activity, they need to create a database audit specification and audit events related to the objects on the Microsoft SQL Server Database Engine they deem most critical. Native tools can help with managing audits, but they require knowledge of Transact-SQL, as well as tedious hours spent crawling manually through audit data. Is there a simpler way to get the security auditing you need? 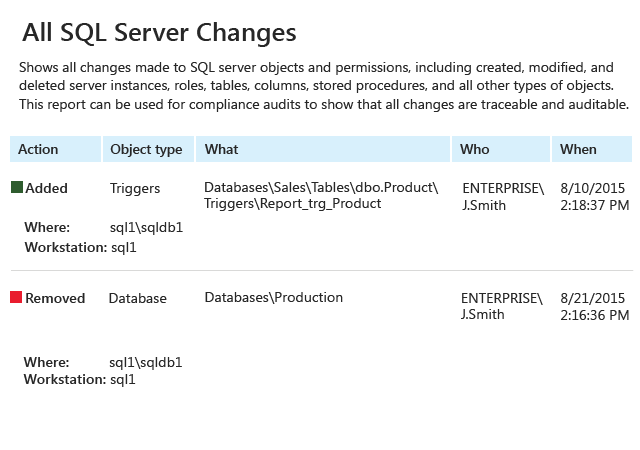 To gain control over events across your SQL databases in accordance with your organization’s audit action plan and SQL Server management best practices, you can enable SQL Server audit by using native SQL database audit tools in SQL Server Management Studio or by writing logins into the Windows Security log. However, you’ll have to write Transact-SQL queries to audit object and user activity across your SQL Server systems, which means you need to be fluent in this language. You’ll also have to spend significant time sifting through mountains of audit logs trying to spot suspicious activity, and worrying that you’ll miss something important. Netwrix Auditor for SQL maximizes visibility into SQL databases by providing insightful, ready-to-use reports on changes made at the SQL Server level, instance level and server instance level, including changes to objects, roles, databases, tables, stored procedures and more. On top of that, the application provides details about SQL Server access events, both successful and failed. Detect and investigate illicit activity, such as database deletions or table removals, with the help of reports that deliver all the critical details about every change, including who performed the action and when and where it occurred. Stay abreast of all attempts to access your SQL Server, including who attempted the access, when and from which endpoint the attempt was made, and whether it was successful. Save time on reporting by simply subscribing to the reports you need most; they’ll be delivered automatically on the schedule you specify. Investigate the root cause of any action that you deem critical, such as unauthorized database modifications, with the Google-like Interactive Search. Spot and remediate insider threats faster with alerts on critical activity. Keep your SQL Server audit data for years in a two-tiered (file-based + SQL Server database) storage and use it to easily generate reports whenever you need to.